If you’d like to skip all the commentary and get to the goods in nauseating detail including weights, just click here. Tent or hammock? I spent a solid 3 months debating over this question and ultimately chose hammock. 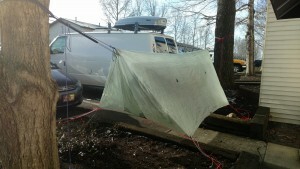 I am starting my hike during the bubble so a hammock will give me some leeway on finding a flat spot to set up shelter. Since it doesn’t touch the ground, it will also help keep some mud out of my pack and tiny living space. Home sweet home for the next 6 months! I’m pretty sure my neighbors think I’m a nutcase for stringing up a hammock and tarp between the two trees outside my front door. At least I’m a prepared nutcase! I picked the Blackbird due to it’s trim 24 oz size (including whoopie slings) and bug-proof-ness. 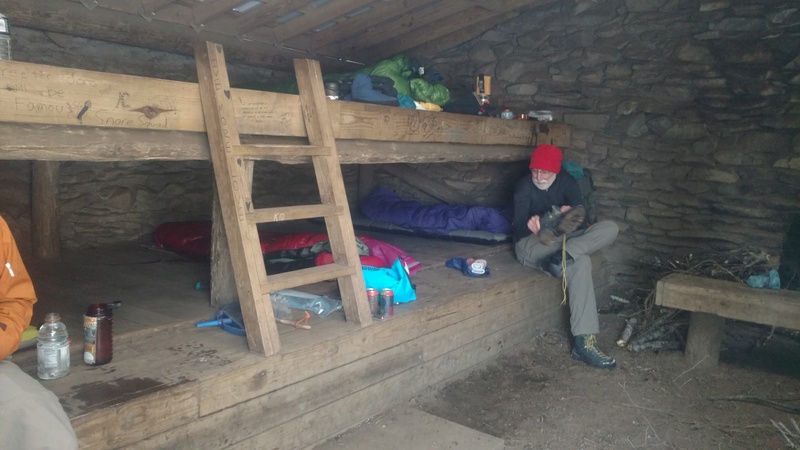 The tarp gives me the four-sided shelter of a tent with less weight, more space, and no worries about tracking mud and dirt inside a closed space. It was my second most expensive piece of gear but saves me an entire pound over a sil nylon tarp. I’m dropping the 7 oz X Frame as soon as the weather starts to get warm. During cool weather, the holes in the pad give me some extra loft underneath my body while in the hammock so my sleeping bag can more effectively keep me warm. I was worried I wouldn’t be comfortable without an inflatable pad because my hips get really sensitive on hard surfaces, but since the Z Sol can be folded over under my hips and is virtually indestructible (and $120 less than a Neoair) it’s a winner in my book, even if it is bulky. My Aplinlite bag is a miracle of sleeping bag engineering but may end up being too warm come summer. I am still debating about picking up a 40-50 degree bag depending how my budgeting/final expenses go in the last few weeks leading up to departure. Sorry Solomon, Salewa’s got you beat. They’re technically an approach shoe made for hiking up short to moderate distances to a climbing crag, and that’s probably why I gravitated toward them. After several hikes and zero blisters (surprisingly living up to their blister-free guarantee) I am absolutely sold on these. I’ll be switching to the vented version as soon as the weather warms up because they are downright toasty when it’s over 70* no matter what sock I wear, but they’ve been great for the winter hiking I’ve done with them. I tried multiple boots and 3 styles of Solomons but boots chew up my ankles and I could feel where the hotspots were going to show up almost immediately when I tried the Solomons. Since the lacing on the Wildfires extends to the toe, they are one of the few shoes that can accommodate my wide forefoot. Thank you Lion Heart for your post on organizing the tiny things! I took her advice to heart and the following fit in a 1L stuff sack. Tiny roll of toilet paper. Garmin Vivofit 2 to track distance, time of day, and total steps taken on the trail- never needs recharging! Somehow it all fits in my pack with room enough for food. Total weight is right around 20 pounds before food or water depending how much clothing I’m actually wearing. I’ll definitely make another list at the end of the trail to see how things change. 25 days until my departure and I’m happy with my overall setup and how it tested out on an actual backpacking trip this past weekend on the AT itself in the Smokies. Want more pictures of my shakedown trip and preparation? Follow me on Instagram! FINALLY!! Somebody posts a gear list with a hammock! Agree with Dylan. Been eyeing the HG cubeb fiber tarps but the cost is prohibitive right now. Let us know how you like it. Also curious how well sleeping pads work as opposed to an underquilt. Rooting for you to make te trek ! Rooting for you to make the trek !